06 Şubat 2019 Çarşamba 08:03 - 11 reads. Napoli is coming next week in the Letzigrund, the number 2 in the Italian soccer . A Feast for the FC Zürich. It is the Ancelotti's, Carlo, the coach, Davide, his son, his assistant, and perhaps even his successor. Napoli was in the Letzigrund, almost 30 years ago. But because Napoli didn't come, since he came, only he's interested – Diego Maradona. Wettingen, a short time before because of hunting scenes on the referee during a game in Sion in the headlines, against Maradona in the Uefa Cup. 100 Swiss francs cost of a place on the rostrum, very much at the time, the Tickets were only sent at the last Moment, for fear of counterfeits. 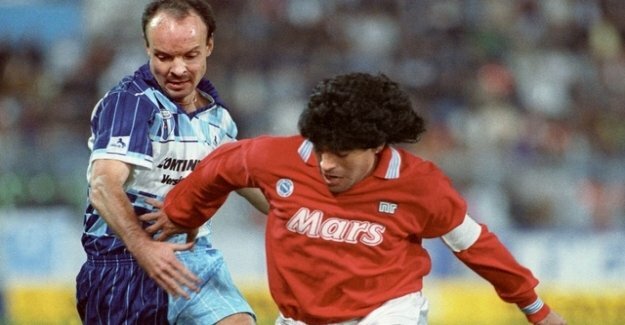 In the summer Maradona had moved once again to Naples in excitement. He had not come back from a holiday in Argentina, and there were pictures, as he lay on a deck chair in a swimming Pool. He seemed to enjoy life long been lying, actually, only the face looked like Maradona, the body is like that of a very well-rounded man. 15 Kilos, it was said later, he had increased. But now he was there, in Zurich, on this Tuesday in October 1989. First of all, in the Hotel, with his mother, his wife Claudia, the Baby in her arms, he played with Dalma, the other daughter. On this fine autumn afternoon after Training was in the Letzigrund. Wettingen had demanded five francs entrance fee, 1500 came, Maradona said it disturbed him that a club deserve it, if he had exercise. As he had been introduced some years earlier in Naples and in the center circle a little had, had come in 75 000 to the San Paolo and had to pay 1000 Lire for admission. "Oh, mamma, oh, mamma, ho visto Maradona", they sang, it was a Neapolitan anthem. Oh, Mamma, I have seen Maradona, also in Zurich. They saw a Maradona, bobbed his torso back and forth, and especially on the grass and ran, always with the Ball on the foot, the head, the shoulders, the knees, his belly remained despite the cure, still considerable, he had 200 yards without the Ball fell to the ground. A magnificent spectacle. The game? 0:0, Wettingen cheered. And the writer Silvio Blatter wrote later in the "Tages-Anzeiger" in an Essay: "Maradona lives from the memories of Maradona."